I had a beautiful, healthy, thriving pink dot plant. It was full of leaves, colour, and beautiful purple flowers. It had many stalks and shoots. Due to a fungus gnat problem that I’ve been trying to contain since October, I’ve had to dry out my plants a lot, and at times I’ve had them sealed in bags to isolate them. The plant seemed to be managing though this phase, with new shoots and flowers continuing to grow, though some of the leaves started to dry and turn brown from the tips. I went away before Christmas and came back five days later to find it significantly worsened. A lot of the leaves had fallen, those that remained were all browned, even the new growth. It worsened over the rest of the holidays (I’ve continued to keep it quite dry). I tried trimming the longest stem to see if it would encourage new growth, but it continues to die. Has it just experienced too much distress? Is there anything I can do to help it? Many of my plants have been suffering with the gnats (even the succulents!) but this seems the worst affected. Are there any steps I can take to help revive it? Should I cut it all? Grateful for your inputs. Thank you. Ps – hopefully the issues are clear in the photo. The plant is about 5-7cm taller than the pic, and was formerly all bushy and leafy where there is now empty twigs. Poor you! It is dreadful to lose beloved plants. 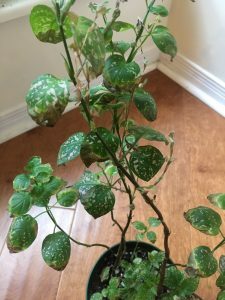 A polka-dot plant, also known as “freckle face” (Hypoestes phyllostachya or H.sanguinolenta) –a beautiful little plant with small, oval-shaped downy leaves spotted with rosy red markings–needs bright, filtered light, to be watered thoroughly when the soil barely dries out (which could be more or less than twice a week), sprayed every day. Keeping the plant on a pebble tray helps as it really needs lots of humidity. Pinching it back as the stems get straggly–will encourage new, thick growth at the crown. If you’re lucky, your polka-dot plant will produce tiny lilac-colored flowers. Hypoestes phyllostachya is native to Madagascar. It is an evergreen tropical subshrub. Here is more information on the plant. There don’t seem to be any serious insect or disease problems with polka-dot plants. That being said, powdery mildew may be an issue. Below is a link to common diseases of house plants. Good luck with your plant. As painful as it may be, you may have to replace it as this plant has a relatively short life span, particularly after flowering.